The Cumberland & Dumfriesshire Farmers Mart P.L.C. had forward 2,201 store hoggs & 526 in lamb ewes at their weekly sale at Longtown on Tuesday 2nd February 2010. Store hoggs were still very dear and short of requirements. Top of £90.50 for Suffolks from Redbanks; Texel £89.50 Haymount, £87.50 Newbiggen, £80.50 Dinwoodie Green; Greyface £83.50 Newbiggen; Charollais £80.50 Lochwood; Lleyn £73.70, £69.50 Chipknowe; Hill Cheviot £67.50 Arkleton and Brookfield, £67.20 Alnham; Blackface £66.50 Woolaw, £63.80 Partridge Nest, £61.20 Baron House; Swaledale £57.80 Allenheads. 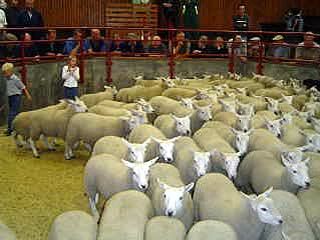 Cast ewes to £93.50 Ruthwell, hill types £77.50 Cooms. Cast rams £73.50 Cothill. In lamb ewes were a quality entry of mostly Greyface ewes and attracted competition with trade excellent. Top of £148 and £145 for Greyface 2 crops scanned twins from Margaret Drive, who also sold 3/4 crops at £138, £132 and £130, others £122 and £120 Falside Hill. Greyface ewes scanned triplets £115 Falside Hill. Greyface ewes scanned singles £95, £92 Margaret Drive.